As his Syracuse teammates changed into fresh clothes and emerged from the locker room after their 87-73 victory at Providence last January, backup point guard Michael Carter-Williams chose to stay behind. The former star at nearby St. Andrew's School dreaded the thought of facing the friends and family who made the short drive to see him play because he'd hardly left the bench that day. With veterans Scoop Jardine, Brandon Triche and Dion Waiters in front of him in the guard rotation, Carter-Williams logged only four first-half minutes and didn't play at all in the second half. "That was a really hard time for me, especially because my friends and family were there," Carter-Williams said. "I felt a little embarrassed, but now looking back, it was a learning experience. For me to be able to make it through something like that, it's preparing me for hard times in the future." Exasperating days like that were common for Carter-Williams during a difficult freshman season in which he didn't play in 11 games and received sporadic minutes in others. The former McDonald's All-American admits he'd get so fed up he'd call his mom and step-dad almost daily to vent and he'd float the idea of transferring once in a while, but now he's thrilled he persevered long enough for his patience to be rewarded. Through eight games this season for No. 4 Syracuse, Carter-Williams has been a fixture in the starting lineup at point guard, averaging 12.4 points, a national-leading 10.4 assists and 3.8 steals. The 6-foot-5 sophomore is currently on pace to become only the third player in the last 30 years to average 10 or more assists per game, joining Baylor's Nelson Haggerty (1995) and Southern's Avery Johnson, who did it twice in 1987 and 88. In an era in which players transfer weeks into their freshman seasons because they're not happy with their playing time or how they're being showcased in a system, the success of Carter-Williams is refreshingly old-fashioned. Many of the 500 players who transfer each year could learn from how Carter-Williams worked through adversity rather than running from it. "What Michael did is what's needed from kids today," St. Andrew's High School coach Mike Hart said. "Michael had to pay his dues like when I went through high school and college. We had some frank conversations last year. He got very frustrated at times. But we all knew his time would come and I'm glad everyone was patient." It's no surprise to those who know Carter-Williams that he has flourished with increased playing time because in some ways he was groomed for this opportunity. His mother, Mandy Zegarowski, coaches the girl's basketball team at Ipswich High in Eastern Massachusetts. His step-father, Zach Zegarowski, played in college at UMass Lowell and coached boys' basketball at Charlestown High during the school's run of four straight state titles. Basketball has been part of Carter-Williams' life for so long that "ball" was actually his first word. The unselfishness and high basketball IQ Carter-Williams displays now at Syracuse are a product of his basketball-oriented upbringing. When he attended his step-father's practices and games at Charlestown High, it left an impression on him observing how a group of inner-city kids from low-income families were able to work together as a team in pursuit of a common goal. He also learned just by watching games on TV with his mother or step-father since they took care to point out when a player stepped up to take a charge or made an extra pass to set up a teammate for an open look. "They always say kids can learn a language easier at a young age because your brain is like a sponge," Mandy Zegarowski said. "Well, he was exposed to basketball at such a young age that I think he did develop better-than-usual court vision and just a sense for the game." Neither Carter-Williams' mother nor step-father anticipated him playing at a high-level Division I program like Syracuse when he was a 5-foot-10, 120-pound wisp of a guard his freshman year of high school. Only after he transferred to St. Andrew's, sprouted up to 6-foot-5 and showcased his ability as a scoring point guard did scholarship offers from Big East programs begin pouring in. 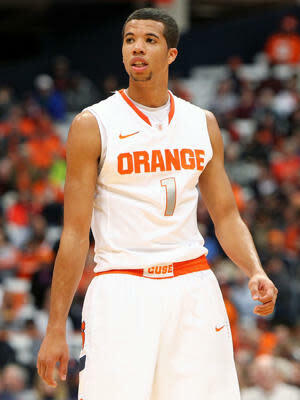 Once Syracuse offered a scholarship in fall of Carter-Williams' junior year, he wasted little time accepting. He liked the coaching staff and winning tradition at Syracuse, plus he valued the opportunity to study broadcast journalism in one of the nation's foremost communications programs. As it grew closer to signing day for Carter-Williams, Hart warned him that sticking with Syracuse would probably mean accepting less playing time than he'd been accustomed to as a freshman because of the upperclassmen ahead of him in the rotation. Jardine and Triche had been rotation players their whole careers and starters the season before Carter-Williams arrived, while Waiters had flashed NBA-caliber talent as a freshman coming off the bench. "One of the big reasons I chose to come here was I knew the practices would be really competitive and I'd get a lot better myself," Carter-Williams said. "I knew I was going to have to wait a little bit, but I thought I was going to get more playing time. It was harder than I expected." The season began about how Carter-Williams envisioned with him coming off the bench but solidly in Jim Boeheim's rotation. That niche role gradually eroded, however, as Jardine and Triche solidified their starting roles and Waiters emerged as the best sixth man in the nation and a future lottery pick. In all three of Syracuse's toughest non-league games and 12 of its 18 Big East games, Carter-Williams either didn't play or logged less than five minutes. That would have been agonizing under any circumstances, but what made it especially tough was Carter-Williams typically played well in limited minutes. Carter-Williams played 17 minutes in a 97-70 romp over St. John's last February, scoring an efficient 13 points, grabbing four rebounds and dishing out three assists. His reward for that performance? A total of four minutes of playing time off the bench in Syracuse's next five games. Since Carter-Williams knew better than to complain to Boeheim with the team on its way to a 34-win season, a Big East title and a No. 1 seed in the NCAA tournament, his family became his outlet. His mother and step-father visited often to try to keep him upbeat and spoke to him on the phone late into the night when they couldn't be there in person. "There was definitely a time when he was really not happy," Mandy Zegarowski said. "We asked Michael, 'Are you saying that you really want to leave?' When we asked him that, he always said no. He wanted to fight through it. "He had days when he was down and didn't feel like doing anything. But he had more days where he'd say, 'I'm going to go early and I'm going to shoot. I'm going to stay late and I'm going to lift. I'm going to work harder and make them want to play me." One reason Carter-Williams chose to persevere was that he understood the basketball adversity he was facing was nowhere near what the inner-city kids on his step-dad's high school team overcame on a day-to-day basis. Plus, Carter Williams trusted his coaches even if he didn't always agree with them and he was smart enough to recognize that with Jardine graduating and Waiters likely to leave for the NBA, the playing time he wanted would be available as a sophomore. "I talked about leaving with my parents, but I was upset, mad and not really thinking straight," Carter-Williams said. "Deep down, I knew why would I leave? We had two great players leaving and we had me walking into a starting spot. There was no way I was going to give that up knowing what I had to go through last year." To make sure he didn't squander his chance, Carter-Williams worked harder than he ever has this offseason, from lifting weights daily and drinking protein shakes to try to get stronger, to doing shooting drills every morning and to improving his nutrition. 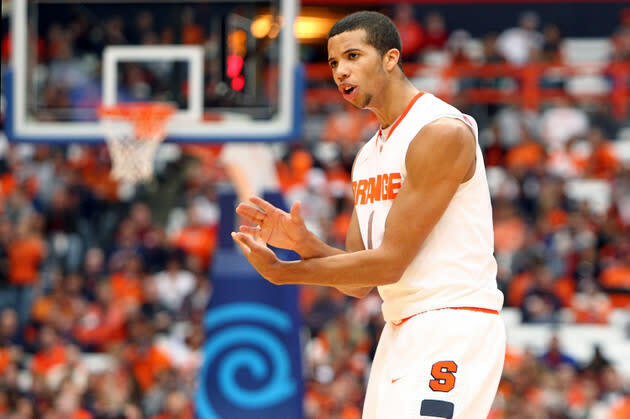 Those efforts have translated into Carter-Williams' emergence as a breakout star for Syracuse and one of the best point guards in the nation. Often pegged as more of a scorer than a distributor in high school because that was the role St. Andrew's needed him to fill, Carter-Williams has shown so far this season that he can also set up his teammates. He has posted nine or more assists in Syracuse's past seven games and 16 against Monmouth on Saturday, the third-highest total in school history behind only Sherman Douglas (22) and Pearl Washington (18). He has performed so well as a pure point guard that fans began to nitpick about his ice-cold outside shooting in November, a complaint that draws a chuckle from Carter-Williams since that has long been the strength of his game. As he reflects on his challenging freshman season and his torrid start as a sophomore, Carter-Williams is grateful he persevered through the tough times. He thinks it strengthened his character, sharpened his work ethic and made him more appreciative of success. "No matter what happens this year, I look at last year as a positive," Carter-Williams said. I made it through last year, which was very hard to do. I still got better every day. Now I'm applying all of last year's hard work to this year."